(Phys.org)—When it comes to tagging items to prove their authenticity, the goal is to stay ahead of counterfeit technology. The best tags are unique, complex, easy to read, and difficult to reproduce. One naturally-occurring authentication "tag" is fingerprints, which are difficult to replicate, but are easy to read. Wook Park and Sunghoon Kwon from Seoul National University developed a process for making anti-counterfeit tags from wrinkled silica polymers that is based on the way fingerprints are used for identification. Their work is published in Advanced Materials. The best tags use non-deterministic coding, meaning that even if you do the exact same process to make the anti-counterfeit tag as you did for another tag, the two tags will still be different from each other. This makes them desirable for anti-counterfeit. However, there is a cost to using these tags. Non-deterministic tags have a higher degree of randomness but their complexity, or security level, and their decoding strategy are difficult to tailor for various products. This makes many of these types of anti-counterfeit tags inefficient for industrial use. Park and Kwon used the way fingerprints produce unique patterns to design an unclonable and configurable anti-counterfeit tag. Their process involved coating substrates, such as nanoparticles, with silica polymers and subsequently drying the polymer-coated substrate to allow the substrate to shrink, causing to polymer to wrinkle. To test whether their polymer tags were functionally similar to fingerprints, they subjected their polymers to similar techniques used to read fingerprints. In these techniques fingerprint patterns, called minutiae, are studied to identify unique minutia points. 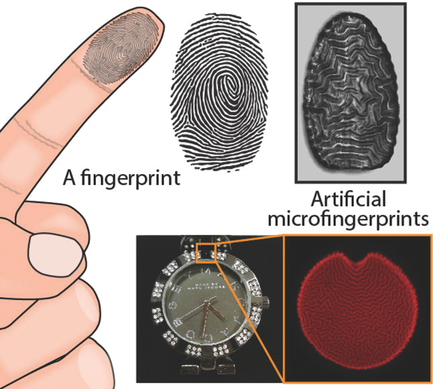 Using the fingerprint algorithm, this technique successfully identified minutia points on the silica polymer proving that a known, and ubiquitous technique, can be used to identify security tags. Furthermore, they found that, compared to synthetic human fingerprints, the polymer tags contained more randomized minutia patterns, meaning individual tags were more unique than individual fingerprints. While the wrinkling pattern was not reproducible, even using the same conditions and substrate, Park and Kwon were able to control minutiae density. By varying the reaction time for the coating process or wavelength of UV used for the photopolymerization step they were able to control the wavelength of the minutiae pattern. Wavelength increased proportionally as coating time increased or as the energetic strength of UV light decreased. The greater the complexity of the wrinkle pattern, the higher the security of the tag. Complexity is proportional to density of minutiae per unit length, and density is inversely proportional to wavelength. Therefore, by changing the reaction time or UV strength, the polymer wrinkle wavelength can be tuned for a desired security level. Park and Kwon point out in their paper that "To our knowledge, the presented fingerprinting approach is the first, among nondeterministic codes, to enable tuning of coding capacity or security level." Lastly, Park and Kwon tested their polymer tag on various objects and under varying conditions. They found that their tag remained intact under high temperatures, sonication, and repetitive swelling and shrinking. Overall, the wrinkle pattern of silica polymers overlaid on a substrate produced a security tag that can be used to ensure the authenticity of various products. The tag has a tunable security level by adjusting the density of minutia in the wrinkle pattern, and the tags are easy to read using the same technology used for fingerprint analysis. An unclonable, fingerprint-mimicking anti-counterfeiting strategy is presented that encrypts polymeric particles with randomly generated silica film wrinkles. The generated wrinkle codes are as highly unique as human fingerprints and are technically irreproducible. Superior to previous physical unclonable functions, codes are tunable on demand and generable on various geometries. Reliable authentication of real-world products that have these microfingerprints is demonstrated using optical decoding methods.